Production Time: 5 business days - Promote your next event, fundraiser or project with this snappy tall box! This clever tin is a unique way to get your name, message or logo in the hands of your customers! 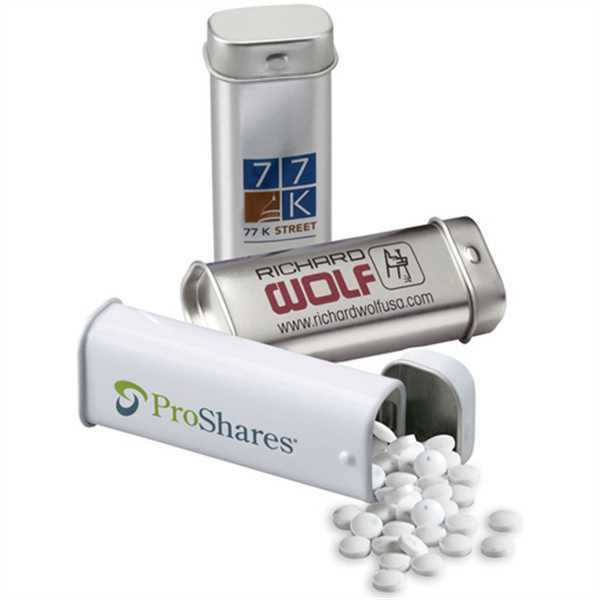 This tin comes empty for you to fill with mints, gum or anything you need to promote your business! These silver tins come with various imprinting options for your customization and individually wrapped for easy distribution! Size: 1 1/4 " x 3 1/8 " x 7/8 "
Imprint Size:2" x 3/4", 7/8" x 3/8"